The town of Danville has long been considered the heart, hub, and center of Hendricks County - not just because it&apos;s home to county offices and the historic Hendricks County Courthouse Square, but because it hosts so many festivals, fairs and special events. It&apos;s also home to an impressive variety of restaurants and shops. Centrally located in the heart of Hendricks County, Danville boasts a population of roughly 9,258 and is located along U.S. 36. Danville may be considered a small town, but it&apos;s far from boring. We moved our family to Danville 11 years ago because it was a small town with a great school system. We didn&apos;t realize then, but sure appreciate now, what an awesome community we would be joining. There are far too many events, attractions and awesome businesses in Danville to list each one, but here are a few places to visit and events to attend. This popular, annual, fall event is one of my personal favorites. 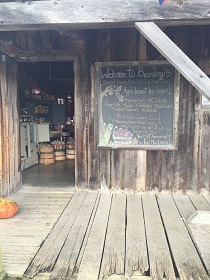 Beasley&apos;s Orchard is one of Danville&apos;s finest attractions, and their Heartland Apple Festival in the fall is the perfect time for folks to experience the Orchard - and our town - in all it&apos;s glory. Hayrides, a corn maze, kids activities, a brimming pumpkin patch, local vendors and delicious food all add up to a fantastic event for the whole family to enjoy. You can read about last year&apos;s festival here and get more information about this year&apos;s here. This event is a perfect example of what makes the town of Danville so unique and extraordinary. This year will be the third annual running of this event that came about as an extension of the popular Mayberry Cafe on the square. A trolley car, Tribute Artists (that so accurately portray the cast of The Andy Griffith Show), games and contests, a parade, a variety of vendors, and of course, episodes of The Andy Griffith Show playing at the Royal Theater, all come together to take guests back in time to simpler days in Mayberry. Click here for a fantastic post written by my editor leading up to last year&apos;s event, and click here for details about the 2016 Mayberry in the Midwest event. There are a lot of shopping and dining options here in Danville, especially for a small town, and the list just seems to keep growing. One of my favorites is among the newer additions, The Beehive. Just (barely) off the square at 55 E. Main St., The Beehive is a great example of the growth our town is experiencing, while maintaining its small town charm. I love that the Beehive uses and sells some really great, locally grown ingredients and promotes other local artists and producers. 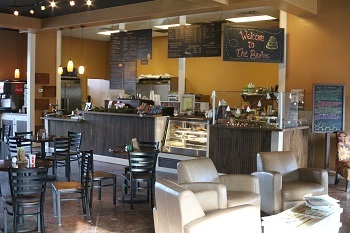 Their menu includes a variety of coffees, teas, baked goods, sandwiches, salads and soups. They also serve beer and wine. In their market, you&apos;ll find locally made grocery items, a variety of wines, local beef, eggs and bacon, as well as handmade jewelry and art. Of course, you&apos;ll also find local honey in the market, that is also used to sweeten many items on their menu. Currently, I&apos;m loving the honeybean latte and BLTA sandwich. Amazing. I also appreciate their longer business hours. Monday-Friday 7 a.m.-9 p.m., Saturday 9 a.m.-9 p.m. and Sunday 9 a.m.-7 p.m. The Beehive is a great place to have a glass of wine and dinner with a friend or have a delicious lunch with the family. Their menu is sure to impress. This Italian restaurant in Danville has been serving lunch and dinner for nearly 20 years. 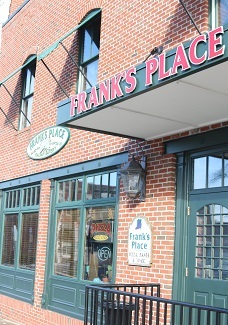 It&apos;s located at 33 S. Washington St., on the historic courthouse square. Personally, I appreciate the warm, intimate setting of this restaurant - as opposed to larger Italian chain restaurants. They serve all your favorite Italian dishes - a variety of pasta, pizza and subs, as well as dinner entrees such as grilled chicken and salmon. My boys love the pizza, while my daughter thinks the ravioli is the best ever. You can dine-in or carry-out. Click here to see their menu, place an order, or check their business hours. I was introduced to this gem of a boutique while writing about Small Business Saturday this past year. I had no trouble finding a few Christmas gifts and instantly fell in love with everything about this shop - the displays, the smell of essential oils and all the personalized jewelry and gifts. A week ago, I stopped in and asked if she could make a personalized necklace I had been wanting for awhile. She could, of course. Just a few days later, I got a call saying it was ready for me to pickup. And it&apos;s perfect. Just what I wanted. This shop offers unique, vintage style jewelry, clothing, accessories and home decor. I&apos;ve found that the best way to keep up with new items and current store hours is to follow the Seize the Night Designs Facebook page. The epitome of small town charm, this historic 1920&apos;s, one-screen theater is a unique and treasured attraction in Danville. The Royal Theater, at 59 S. Washington St., uses the latest technology to bring you current box offices hits, classics, as well as live entertainment. What I personally love and often hear from others, is that this theater is appreciated for its accessibility and affordable ticket and concession prices. There is always something to see at the Royal - new movies,"classic" special features, film events or live concerts. For theater information and current show times, click here. Gill Family Aquatic Center - This outdoor pool and water park features two water slides, diving boards, a toddler area and a lazy river. It&apos;s a popular destination during the summer months and cherished amenity in the Danville community. You can join us for the 2016 season beginning May 28. Symphony in the Park - This summer concert featuring the Indianapolis Symphony Orchestra has become a yearly tradition for many. It&apos;s presented at the outdoor Martin Amphitheatre in Ellis Park. For more information on this year&apos;s concert, click here. Winterland - This awesome holiday light display draws an impressive crowd every year through the month of December. This drive-through light display has also become a tradition for many area and distant families. Hopefully, this list gives you an idea of how much there is to see and do in the town of Danville, though I just barely scratched the surface. I might be a little biased, but I think our town is pretty extraordinary. Stop by and see what you think.